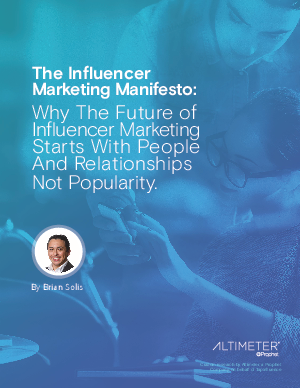 Why the future of influencer marketing starts with people and relationships not popularity. “Influencer” is not only one of the biggest buzzwords and efforts in digital marketing, it is also one of marketing’s biggest opportunities. Facebook, Instagram, Vine, Twitter, Snapchat, Blogs, YouNow, YouTube, Periscope: each of these social platforms only accelerates and expands the potential for digital influence. At the same time, these platforms scatter the attention and activity of consumers across networks and apps, making them increasingly elusive, and immune, to traditional marketing approaches. As a result, marketers face increased pressure to reach consumers. Influencers have built bridges between brand and audience and marketers are starting to increase efforts to reach new territories. In order to learn new expertise and discover how to succeed in new paradigms, we have to study where we are, what we don’t know, and also, most importantly, we have to understand the world of influencer engagement through the perspective of influencers themselves. To do that, I partnered with TapInfluence, the leading influencer marketing automation software solution for brands and agencies. Together, we studied the state of influencer marketing by surveying marketers and then separately polling influencers to get a balanced view. The insights were compelling. When compared, they were also revealing.